Tuesday evening, after the Annapolis conference, Natan Sharansky visited the offices of COMMENTARY and filmed a Q&A with editor Sam Munson. The four-minute video is below, with a transcript of Sharansky’s analysis of Annapolis, followed by an eerily prescient excerpt from his book. MUNSON: So I just wanted to get your thoughts very quickly about what Annapolis means -- about what it means for the region, and sort of how it fits into the Bush administration’s democracy promotion agenda, whether it is a step forward there or a step back, a consolidating step [or] an undermining one, and whether you think anything meaningful will come of it. . .
SHARANSKY: Annapolis means nothing for the region, because it will have absolutely no influence -- absolutely no positive influence. Annapolis means going back to the illusion of Oslo, when it was thought that you can build [a] peace process ignoring what is happening inside Palestinian society – and not only ignoring [it] but thinking that bringing stability . . . you can bring peace. But Annapolis is very unfortunate because this step is coming with [an] Administration which proclaimed that only Palestinian leadership devoted to democracy can bring peace and can be [a] real partner, and unfortunately this [unintelligible] are taking place ignoring absolutely the absence of any democratic reforms inside Palestinian society -- not putting any demands on building civil society, and again bringing back this illusion and hope that simply by strengthening [a Palestinian leader] you can make peace. But isn’t Abu Mazen the “democratically elected” leader of “all” the Palestinians? In Sharansky’s view -- eloquently expressed in his book “The Case For Democracy: The Power of Freedom to Overcome Tyranny and Terror” -- elections are “never the beginning of the democratic process.” He wrote that a democratic society must have certain basic institutions in place -- a free press, the rule of law, independent courts, political parties and a loyal opposition, freedom of religion, etc. -- and a society without such institutions will never be a partner for peace. The Road Map required the Palestinian Authority security forces to take “sustained, targeted, and effective operations” aimed at confronting all those engaged in terror and to ensure the “dismantlement of terrorist capabilities and infrastructure.” Instead, Abu Mazen tried to negotiate a “hudna,” a temporary truce in which all the terror groups would agree to halt violence . . . In trying to bypass the Palestinian commitment to fight terrorism by getting terror groups to hold their fire until further concessions could be wrought from Israel, Abu Mazen was trying to do with the Road Map what Arafat had done with the Oslo Agreement . . . When it became clear that the Palestinians were not prepared to fight terrorism, the “international community” grew impatient. Here too, it felt like we had returned to the days of Oslo when in spite of Palestinian noncompliance, the world pressured Israel to keep the peace process moving. . . .
Sharon’s government was accused of not doing enough to “strengthen” Abu Mazen. In fact, some respected voices abroad began to question the wisdom of making the Palestinian commitment to fight terrorism a condition for moving forward. It would have been better, they argued, to take steps in parallel. It all sounded familiar: Demands for compliance give way to parallel steps, which eventually give way to one-sided concessions. . . .
With Abu Mazen held up as a moderate leader who would fight Palestinian terrorism and make peace with Israel, it was clear to me that Oslo’s false assumptions would once again guide the peace process. Like their Oslo predecessors, those supporting the Road Map did not recognize that moderation is not a function of a leader’s disposition or promises, but rather a function of the nature of the society he or she governs. The Road Map had it precisely backwards. One can rely on a free society to create the moderate, but one cannot rely on a moderate to create a free society. The Road Map predictably failed, so Rice and Bush decided that Phase I and II could be skipped, and they thus “accelerated” the process into Phase III -- ignoring their written promise to Ariel Sharon not to do so -- and promised that Phase I would come later, after Israeli concessions on borders, refugees, settlements, Jerusalem, and all other “core issues” the Palestinians want to raise. It is a farce, and if you watch the video, you will see in Sharansky’s eyes the question that Melanie Phillips asked earlier this week. At one time, Bush knew better and told others. UPDATE: See this morning's New York Sun: Eli Lake, "Annapolis May Be Catastrophe for Israel, Ex-Official Says," quoting Sharansky: "You have one force, Hamas, that does not recognize Israel, which is not going to recognize Israel, and fight Israel. The other force, which is our so-called partner, accepted by everybody, it doesn't represent anyone, has no power, and cannot influence anything." Scott Johnson had an important post yesterday at Power Line (“When Words Lose Their Meaning”), about President Bush’s suddenly “inoperative” standards for dealing with the Israeli-Palestinian conflict. In announcing the international conference in July, Bush said attendance would be limited to those who rejected violence and recognized Israel’s right to exist. Instead, Syria was invited and offered a forum to present its demands, and Saudi Arabia was not required even to shake the Israeli Prime Minister’s hand. The conference resulted in American concessions to Syria and Saudi Arabia, not by them -- and not all the concessions may have been made public. [Bush] went [on] to recite a litany of attacks the Israeli people want ended – rockets, suicide bombings, assault. Well, yeah. The presidential address also failed to acknowledge that Israel, committed under Phase I of the Roadmap only to dismantle certain settlement “outposts” and to “freeze” settlement activity, had already exceeded that obligation by dismantling 25 complete settlements, in both Gaza and the West Bank, and had received only rockets in return. The pandering presidential rhetoric, to a room filled largely with Arabs (and third-party countries who could care less), effectively excused the Palestinians for their failure to dismantle even a single terrorist organization in the nearly five years since they promised to do so (they simply “recommitted” to doing it again), much less control the “military wing” of the Palestinian representative sitting with the president, which had murdered another Israeli father just the week before. Now that the Palestinians have recommitted (for the third time), the U.S. will “monitor” their future compliance, but is unlikely ever to give them a failing grade. They will be praised for their “effort” and given a social promotion. Call it the international version of the soft bigotry of low expectations, which will have the same effect as the domestic version. It already has. At one time, President Bush was known for being a president who said what he meant and meant what he said. When asked what President Bush meant when he said that an Iranian nuclear weapon was “unacceptable,” John Bolton used to say that it meant it was “unacceptable.” These days, Bolton doubts the President will act. See also Melanie Phillips, "Mr. President, What Has Happened to You?" As Johnson noted in his post, it “can’t be good for the United States when a president's words lose their meaning.” It is highly unlikely that the Iranians, watching the proceedings this week at Annapolis, are concerned about them. Syria was beseeched to attend the farce even as it was working to throw into chaos the selection of a new Lebanese president to replace Emile Lahoud, the Syrian plant whose term was due to expire last week. . . . . It has been over two years since President Bush and Secretary Rice made a show of demanding action on the U.N. investigation [of the murder of Lebanese Prime Minister Rafik Hariri] that has implicated top Syrian officials, including Assad’s brother and brother-in-law. The result . . . is nothing. Meanwhile, Hezbollah, with Syrian backing, continues to threaten a renewal of the war it started against Israel in the summer of 2006. Of course, the portrayal of Syria as a legitimate participant in a peace initiative is no more absurd than the participation of the Palestinians themselves. On the Palestinian side, the primary obligation was to end terrorism. That’s precisely the same promise the terror master and Palestinian founder Yasser Arafat gave to President Clinton after the first and before the second Intifada. And it is precisely the same promise that Mahmoud Abbas gave to President Bush after the second Intifada. The government is committed to the Palestinian leadership’s official approval of [the Roadmap] reached after an in-depth and thorough review of it. . . . [W]e will not negotiate the Roadmap. The Roadmap must be implemented not negotiated. The roadmap says: all security services are under the control of the PM, but I didn’t even ask for the unification of the services; when I was asked, I said the unification of the efforts of all security services and not unify all security services; thus, what we demanded was coordination and nothing more between the security services, and when the Americans used to tell us the unity of the services, we used to tell them we don’t want this.
. . . the roadmap talks about the unification of the security services but we overcome this obstacle; the roadmap talks about striking and uprooting the factions and we overcome this obstacle too because we will not fall into this trap; we don’t want a civil war . . .
After Arafat’s death, Abbas was elected as president, running essentially unopposed, and the U.S. again began pressuring him to dismantle the terrorist organizations, as he had agreed in the Roadmap to do, and he did nothing. QUESTION: . . . [Israeli] military officials are saying, that while this disengagement is taking place, Hamas is building up a popular army. It's alleged to be training that army in Gaza, they -- and preparing for more suicide attacks after the disengagement and stockpiling rockets. First, the facts. What is your assessment of those assertions? QUESTION: Some increased Hamas activity? SECRETARY RICE: Yes, well, I don't doubt that Hamas is trying to train and to increase its capacity. It would be one of the things that we've talked to the Palestinian Authority about is that Hamas very often uses periods of calm to try and enhance its capacity. QUESTION: Its capacity to do what? SECRETARY RICE: Its capacity to cause trouble. It's a terrorist organization. But, of course, the Palestinian Authority is enhancing its capability as well in this period of time. That is why the continued security reform is important. QUESTION: But in terms -- excuse me for interrupting. SECRETARY RICE: Yes. That's where I was going. That's exactly where I was going. This comes to the fact that you cannot simply let a terrorist organization sit forever, that you cannot -- that there is an obligation in the roadmap to dismantle the infrastructure of terrorism, not just coexist with it. SECRETARY RICE: And so that is one of the most important next elements. I know that the Palestinians have been concerned and so are the Israelis, to have calm in this period of time. It has been a good thing that thus far the Palestinian factions have more or less respected that calm, but that isn't a substitute for the dismantling of the terrorist organizations, because as Abu Mazen himself has said, you can only have one authority and one gun. SECRETARY RICE: So the answer to the question, what comes next, is that one of the obligations in the roadmap is that the Palestinian Authority should have unified security forces that are all under the authority of the Palestinian Authority and its leadership, its elected leadership. There will be elections in January. But the Palestinian Authority is going to have to deal with the infrastructure of terrorism, that's one of its obligations. SECRETARY RICE: No, I'm not talking about a sequencing here because the roadmap is assiduously not sequencing one step after another. It gives, in parallel, certain obligations to both sides. And the obligation of the Palestinians has to do with the dismantling of terrorist infrastructure and organizations and they're going to have to do it. And Abbas didn’t do it. QUESTION: At what point [does] the Administration insist that [Abbas] abide by the requirements to the roadmap, which is not temporary truce agreements but disarming and dismantling terrorist groups? SECRETARY RICE: Well, we are insisting on it every time we talk to him. But you want him to be successful when he does it. You don’t want him to go to dismantle Hamas and fail. And so we’re trying to increase his capability on the security forces side to create better political conditions on the ground. But there’s no doubt that they’re going to have to dismantle these terrorist organizations. . . . QUESTION: He has said, I mean, kind of recently, but at some point he has said he did not favor the idea of removing arms by force, you know, arms that are controlled joined by other Palestinians. SECRETARY RICE: Well, he has said that he believes that they can build a national consensus that there should be one authority and one gun. What he’s not said publicly is what he will do if that fails. But again, I don’t think this is -- I do not think that he is confused about what it would mean for the long-term viability of the Palestinian Authority if Hamas has both political option and a violence option. He can’t live with that either. Four months after that, it was too late. The Palestinians elected their premier terrorist organization to control their legislature. Abbas then entered into a “unity government” with them. Earlier this year Abbas’s forces were expelled from Gaza by his partners in his unity government after a battle that lasted less than a week. The only thing currently keeping him in power in the West Bank is the IDF. And the U.S. State Department. Now Abbas arrives in Annapolis ready to sell the Israelis and Americans the same promise for a third time: He will (to use President Bush’s words in his November 25 Statement) “recommit to implementing” the Roadmap -- with absolutely no possibility of dismantling terrorist organizations and infrastructure, either in Gaza or the West Bank. It is, as Andrew McCarthy notes, a farce. UPDATE: Say, aren't all of these guys the same ones who made the first two promises? Rep. Eric Cantor (R-Virginia), the Chief Deputy Whip for the Republicans in Congress, was in Jerusalem yesterday to give a speech about keeping Jerusalem united. Many of my colleagues in Congress have asked me why -- why I consider Jerusalem so important, and why they too should be concerned about the state of this city. I remind them that Jerusalem is not merely the capital of Israel, but the spiritual capital of Jews and Christians everywhere -- it’s the site of the First and Second Temples, which house the Holy of Holies. And it’s the direction that we Jews around the world face when we pray. This glorious City of David is bound to the Jewish people by an undeniable 3000-year historical link. Here is the seven-minute video of Rep. Cantor’s remarks, recorded by the invaluable One Jerusalem. If you have only 45 seconds, skip to 6:40 of the video for the final 45 seconds, directed to Boogie Ya’alon in Hebrew and then translated. The One Jerusalem bloggers conference call with Cantor earlier this year is summarized and linked here, and is worth reading and listening to as well. Would You Buy a Used Peace of the Brave From This Man? There is a deep sense, among Palestinians and not just Israelis, that Mr. Abbas, although he was elected essentially unopposed, is a virtual president in charge of little, and that if the Israeli military pulled out of the West Bank, he would not last more than a day. Abbas's record as a leader is dismal. He failed to unite the security services under one organ as he pledged and has not followed through with his anti-corruption election campaign promises. If anything, the chaos within the PA increased under his presidency. The Hamas takeover of Gaza is an obvious indication of his weakness. Initially, Abbas seemed potentially heroic, when he attacked the Palestinian resort to violence in general, and the suicide bombings in particular. Alas, since then he has tangoed into the sunset with Hamas and remained ineffective even when they, in the middle of their dance, stabbed him in the back. The Palestinian Arab territories are run by two warring mini-authorities. One of them -- spread over the West Bank -- is headed by President Abbas of Fatah, a man whose powers barely extend to the porch of his residence in Ramallah. The other, headed by Hamas, is a large collection of gangs, terrorists, and jihadist groups in the Gaza Strip. Neither side has any constituents who can make a deal, keep one if it were made, or even deliver on any pact with other Arabs, let alone with the Israelis. Ehud Olmert plans to "insist" that any agreement with Abbas be conditioned on Palestinian compliance with Phase I of the Roadmap. Last month, Abbas asserted that the Palestinians have already handled “90 percent” of their obligations under Phase I. Three weeks ago, in a pre-Annapolis photo-op, Abbas sent 300 policemen into Nablus to make several arrests, so his estimate of Palestinian compliance is probably up above 110 percent by now. QUESTION: Madame Secretary, the Palestinians and the Israelis didn't reach yet -- till now an agreement on the document, the joint document. SECRETARY RICE: But the point of the document is simply to show that -- show how they intend to move forward, kind of what is the work plan ahead of them. There was a time when I think there was some discussion of, would it be appropriate to write down understandings that Olmert and Abbas were coming to in their work. But it maybe isn't so surprising that when they decided that really they should just go for the negotiations, right? -- not try to get some kind of interim document, not try to get some kind of statement of principles, go for the agreement -- that the weight shifted to getting themselves ready to negotiate the agreement rather than talking about principles that might either prejudice somebody's negotiating position or force people to try and say something early that might make it harder to negotiate later. I think that what really happened here is that what looked like it was going to be a document that was almost a holding pattern to come to Annapolis and say, look, we really do think we can move forward, in their discussions as they moved and moved and moved, they really decided what they wanted to do was launch negotiations. And that made the nature of the document very different, and I think that's actually a healthy development because they now -- my own view of this is that it's hard with something this complex to just have principles because the devil, in a sense, is in the detail. Might as well get to the detail. And that's what they're going to do. So the conference will “launch negotiations” -- since the last few months of actual negotiations over a “document” have failed. Since failure is not an option, this will be called a success. Ambassador John Bolton appeared today on The ZOA Middle East Report (WNWR1540 AM in Philadelphia) with Lori Lowenthal Marcus and Steve Feldman. AMBASSADOR BOLTON: . . . that’s why people like Peter Hoekstra and Ileana Ros-Lehtinen in the House have called for every member of Congress to be briefed. They’re growing suspicious that the Administration is keeping all of this quiet, not because of legitimate intelligence equities, or legitimate military equities, but because they are afraid that if people know what that facility actually was, that it could destroy the six-party talks over North Korea and to tank the Annapolis conference as well. FELDMAN: Ambassador Bolton, where do you see things happening with Iran and its nuclear aims? Is this attention focusing on Annapolis kind of distracting from that situation? AMBASSADOR BOLTON: Well I think it is diverting from the threat that Iran poses. There is a meeting right now, literally as we speak, this week in Vienna, the International Atomic Energy Agency. In their most recent report – and this is by Mohammed ElBaradei, who in my view has been an apologist for Iran for some number of years now – even that report says Iran’s cooperation is only reactive; they give up information only when they’re essentially forced to; and most chillingly of all, it says the IAEA has decreasing visibility into the Iranian nuclear program. I think Iran is very close to acquiring a nuclear weapons capability. I think they’ve mastered the science and technology to do so, and I think deferring to the Europeans over the past four-plus years for their negotiation, which has failed to dissuade the Iranians from this strategic decision they have been pursuing, I think it leaves us with very few options. I think we’re down to two basically: one is regime change in Teheran, and the other as a last resort is the targeted use of military force against Iran’s nuclear weapons program. MARCUS: When do we know we’re at the last resort? AMBASSADOR BOLTON: Well I think we’re very close to it now. You know, you hear all kinds of different estimates about when Iran will actually have a nuclear weapons capability. And I think as we’ve seen in recent years, people can legitimately disagree in good faith about these kinds of questions, based on estimates and assumptions and projections, which if changed only slightly can lead to a very different result. So I have to say, I do not believe in just-in-time non-proliferation. I don’t want to take the risk that we have underestimated Iran’s capacity, as we underestimated Iraq’s capacity before the first Persian Gulf war. They were a lot closer to nuclear weapons then than we had thought. You can misjudge somebody in many, many directions. And if you say “well, we’ve got three years until Iran has the bomb, that means we can wait until two years and nine months away before we do something dispositive,” that kind of mentality can get us in a lot of trouble. JCI: . . . The question I wanted to ask you is about the meaning of the word "unacceptable" in international diplomacy. I think the word "unacceptable," as it relates to Iran's nuclear weapons program, has now been used by the President, the Vice President, the Secretary of State, by you as UN Ambassador, and Condoleezza Rice used it again yesterday in her speech in Nashville. And my question is, since the Bush administration has repeatedly used that word, is it possible for the administration to leave office having accepted the unacceptable, or once the American government uses a word like that, does it need to do something conclusive on way or the other? BOLTON: Well, I'm very worried the Administration will leave without doing anything effective. I used to say when I was in the government that I thought the president was a man of his word and when he said something was unacceptable, what he meant by that was, it was unacceptable. And to me that means, everything else having failed, which is just about where we are, military force as a last resort against the Iranian nuclear program has to be on the table. I don't think that's an attractive option. I'm not looking forward to that happening. I wish we had done more to effect regime change over the past four years; I think we'd be in a very different place if the Europeans has stood with us four years ago; strong economic sanctions [indistinguishable] different, but I think we've just about played out the diplomatic option now, and if regime change doesn't come about quickly, then unless you're prepared to accept a nuclear Iran, then military force is the only other option. If you had asked me a year ago, I would've said I thought the president was prepared to do it. I think the State Department is telling him today, "Don't do it, don't do it." After the election next year they'll tell him, "Don't do it, you're a lame duck, leave it to the next president." I think we're really at risk at this point, and that's just a fact. [Emphasis added]. The Palestinians repeated their daily threat not to attend unless Israel meets their lengthening laundry list of demands that they are making for their “attendance” at a conference intended to give them a state. (They also want additional “confidence-building measures” for their perennially fragile confidence). Among the principles sharply in dispute is whether Israel is a Jewish state. "We will not agree to recognize Israel as a Jewish state," says Palestinian negotiator Saeb Erekat . . .
One would have thought the question of Israel's Jewishness was settled 60 years ago by a U.N. partition plan that speaks of a "Jewish state" some 30 times. . . . If Israel is not a Jewish state, it may as well be called Palestine. If the existential issues of 1948 cannot be resolved, there is little point in addressing the territorial issues of 1967, which are themselves almost impossible to address. Matters are not helped by the unusual political weakness of the key participants. 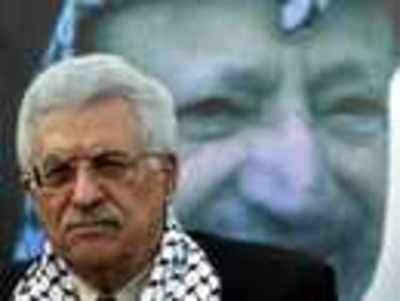 In the last year, Mr. Abbas has lost half his kingdom. He will swiftly lose what remains of it the moment "Palestine" comes into being and the Israeli army isn't around to suppress Hamas as an effective fighting force. [D]espite all the problems in pulling the meeting off, despite the failure up to this point to get Israel and the Palestinians to agree to a joint statement, despite a realization in Washington that Palestinian Authority President Mahmoud Abbas does not have the ability to carry out an agreement and that Prime Minister Ehud Olmert may not be able to carry it off politically, the US is dead set on going ahead with the meeting. The reason: US President George W. Bush announced in July that such a meeting will be held in the fall, and -- as a result -- such a meeting will be held in the fall, ready or not. Bush cannot afford to be seen now as someone who cannot even succeed in bringing two parties heavily dependent on the US to a US-sponsored meeting. That would be a huge slap in the face, and another sign of US weakness in the region. Actually, the slap in the face would be another self-administered one -- like Katrina, Harriet Miers, and amnesty for illegal aliens. It was apparent that this was the Harriet Miers of peace plans the day after it was proposed. It should have been apparent the day before. To insure that "success," he will sprinkle concessions left and right before he even gets there -- prisoner releases, checkpoint reductions, settlement freezes and other concessions -- like a flower girl throwing pedals on her way toward the alter. But he will obtain no concessions in return, nor even a "confidence building measure," such as the recognition that Israel is a Jewish state. 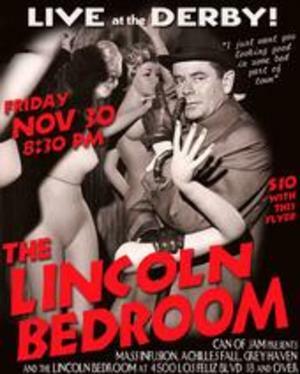 The Lincoln Bedroom will appear at 8:30 p.m. November 30, 2007 at The Derby (4500 Los Feliz Blvd., Los Angeles, CA 90027), the historic venue where “Swingers” was filmed. It promises to be the best TLB concert yet. 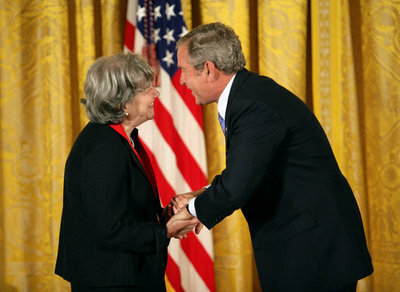 President George W. Bush presents the 2007 National Humanities Medal to scholar Ruth R. Wisse of Cambridge, Mass., Thursday, Nov. 15, 2007, in the East Room. White House photo by Eric Draper. her scholarship and teaching that have illuminated Jewish literary traditions. Her insightful writings have enriched our understanding of Yiddish literature and Jewish culture in the modern world. National Humanities Medals were also presented to Cynthia Ozick for her literary criticism (“In her criticism and essays she has been a lifelong advocate and practitioner of moral clarity and literary excellence”); Victor Davis Hanson for his scholarship on past and present civilizations (“He has cultivated the fields of history and brought forth an abundant harvest of wisdom for our times”); Roger Hertog, whose parents were Jews who fled Germany under Hitler and who is today chairman and part owner of the New York Sun, board member of COMMENTARY magazine and the American Enterprise Institute, and one of the founders of the Shalem Center in Israel; and six other honorees. The National Humanities Medal was inaugurated in 1997. Up to 12 medals can be awarded each year. The profiles of all the 2007 recipients are here. Ruth Wisse traces her passion for teaching to the new Jewish immigrants who were her grade school teachers in Montreal. "I had brilliant teachers at my Jewish day school. These young men had no better opportunities. They were displaced intellectuals and went into primary education to our extraordinary benefit. They were engaged with life. At an early age I saw the calling of literature and teaching as inseparable from civic responsibility." Wisse has been a tireless advocate for a nearly lost literature. Through scholarly and popular books, anthologies, lectures, teaching, and helping to found libraries and archives, she has brought Yiddish writers to new audiences. Today, classes in Yiddish literature and Jewish studies are available at many American universities, and in 1993 Wisse became Harvard's first professor of Yiddish literature. But when Wisse wanted to study Yiddish literature in the late 1950s there were few choices. She went to Columbia University, one of the rare institutions to offer such a program. It was part of the linguistics department, but you could read Yiddish writers in the department of English and comparative literature. Returning home to Montreal, she pursued her interest by other means, getting a PhD in English at McGill University, but writing her dissertation on the "Shlemiel as Hero in Yiddish and American Fiction." As a teaching fellow there, she was able to start teaching Yiddish writers. Bit by bit, the classes she introduced led to a curriculum and eventually helped found a Jewish studies department. "I am proud that the university built this program without relying on private donors. To this day, I believe, there is only one endowed chair. McGill took the responsibility." Wisse was born in Czernowitz in what is today Ukraine, but was then part of Romania. Her father, a Lithuanian, had gone there to start a rubber factory. He received a medal from the king for his work, and this honor saved the family. It allowed him to take his family out of the country as the Russians advanced in 1940, going to Lisbon as "stateless persons." From there they went to Montreal where the family, with foresight, had bought a discarded textile factory -- the Canadian government happily welcomed Jewish immigrants who were planning to create jobs. The family spoke Yiddish at home, and Wisse considers herself a product of the thousand-year-old Yiddish culture that spread from Europe to America in the nineteenth century. She adores the culture's variety and the fits and turns of its assimilation in America, citing Emma Lazarus's famous sonnet "The New Colossus" as an example. Wisse notes how it was Lazarus's work with Jewish immigrants from Russia that spurred her to write about the Statue of Liberty. Lazarus's words completely redefined the symbolism of the statue in New York Harbor. "The statue was given to the United States by French republicans. She is holding a torch of liberty, which was supposed to represent what was passed from France to America -- liberté, egalité, fraternité, shared between the old world and the new. Along comes Emma Lazarus and writes a sonnet that is put at the base of the statue: 'Give me your tired, your poor/Your huddled masses yearning to breathe free.' [Lazarus] had worked with the new immigrants, people seeking escape from Europe. The passing of the torch from Europe to America is recast as American refuge from Europe." Wisse's masterpiece is The Modern Jewish Canon: A Journey through Language and Culture (2000), which presents decades of scholarship to the general reader. It makes the case for the centrality of Yiddish literature to any understanding of the modern Jewish experience. Wisse, though, calls the book merely "a signpost on an unfinished road," knowing that literature must be argued about and inflame passions to survive. And that is the real challenge for a scholar of a dying language. "Yiddish was an expression of the Jewish way of life, but also of the degree of separation from the rest of European society. Once Jews wanted to become more integrated into their surroundings, they sacrificed the language that kept them apart." Yet Wisse notes the pluses, too. "The possibility of assimilation is the greatest gift that America gives to the Jews. One should say a blessing for this possibility at Thanksgiving. Once there was great suspicion of what the Jews brought. Now there is a tremendous level of comfort." Wisse is a prolific commentator on the Jewish experience and politics. Her 1990 book, If I Am Not for Myself. . . : The Liberal Betrayal of the Jews, caused widespread debate with its analysis of American Jewish politics and the epigram-like quality of its insights: "Despite the unparalleled success of anti-Semitism, few university departments of political science, sociology, history or philosophy bother to analyze the single European political ideal of the past century that nearly realized its ends." This year she published a small book, Jews and Power, which argued that anti-Semitism has become a political phenomenon and can be understood today in no other terms. And she has grown more involved in the battles over the future of the universities. She views this work as inseparable from her scholarship. "The university has to be a good as possible. We must fight. My teachers took the same stands. We must all be upholders of certain values." COMMENTARY has made available, at no charge, two of Ruth Wisse’s essays from the magazine, “At Home in Jerusalem” (April 2003) and “Yiddish: Past, Present, Imperfect” (November 1997), as well as essays by Cynthia Ozick and Victor Davis Hanson. The choice of Israel as scapegoat and target of the longest war in modern history has put more intense pressure on that country than any democracy has ever had to bear. Imagine Winston Churchill having to screw British courage to the sticking point not once but over and over again, decade after decade, from 1939 until today. It would have become intolerable. But Israel cannot get out of harm’s way. Its citizens have had no choice but to become democracy’s fighting front line.